Tropical Storm Mario was estimated slightly slowed down and intensified while moving between Laoag City and Ilocos Norte, as of 5 AM advisory of PAGASA. Bagyong Mario was forecast to move North at 15 kph. According to our Weather Bureau, Bagyong Mario eye/center was located at 137 km Northwest of Laoag City, Ilocos Norte (19.1°N, 119.7°E), based on radar and other available data of PAGASA. 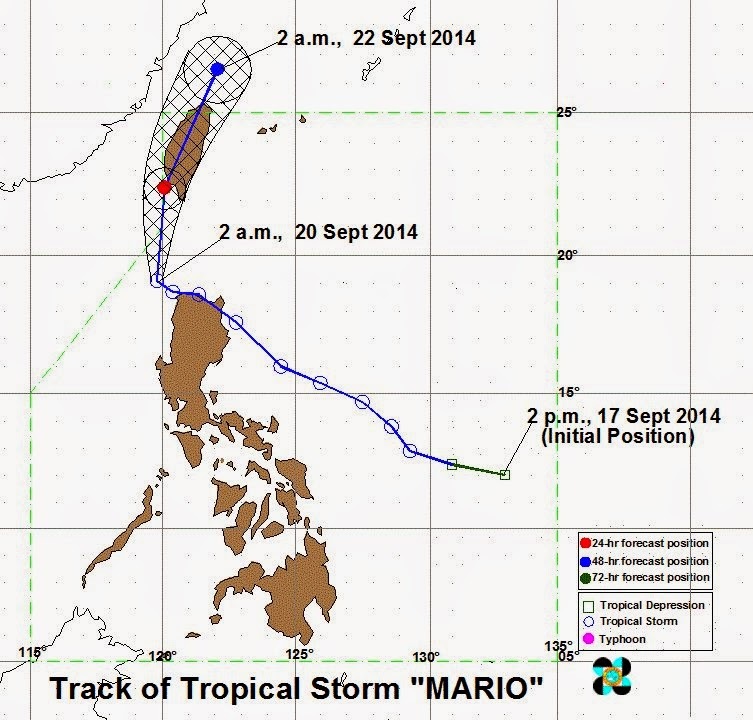 #MarioPH has a maximum sustained winds of 95 kph near the center and gustiness of up to 120 kph. PAGASA said, on Sunday morning it will be at 254 km Northwest of Itbayat, Batanes and by Monday morning, it will be at 635 km North of Itbayat, Batanes or outside the Philippine Area of Responsibility. Public Storm Warning Signal no. 2 are still placed under the following areas; Calayan and Babuyan Group of Islands, Batanes Group of Islands, Apayao and Ilocos Norte. Then signal no. 1 in Cagayan, Kalinga, Abra and Ilocos Sur. According to PAGASA, the estimated rainfall amount within the 350 km diameter of the Tropical Storm is from 7 – 20 mm per hour (moderate - intense). You may see the next weather bulletin on PAGASA portal and Twitter issued at 11 AM today. For more information about the Bagyong Mario Weather Update (September 20), kindly bookmark this page and share to your joined social networking sites. Comments or suggestions about "PAGASA Update: Bagyong Mario moving Northwest of Laoag City (September 20)" is important to us, you may share it by using the comment box below.